This entry was posted on Wednesday, February 25th, 2009 at 11:29 am and is filed under Political, UML. You can follow any responses to this entry through the RSS 2.0 feed. You can leave a response, or trackback from your own site. 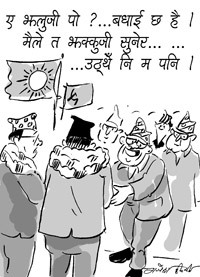 wow..it’s brilliant..very true, MKN has developed this election phobia since last CA poll. 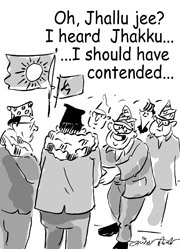 Rajesh ji: your most recent cartoon (Jhakku vs Jhallu..) is hilarious. Very smart. Keep it up. Gajjab cha Kartoon Ajha Gajjab kartoon banaudai jau. Subhakamana.